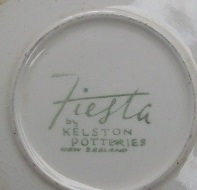 Fiesta by Kelston Ceramics New Zealand ... another! This is pretty grotty, but it didn't cost anything so I got it to record the pattern. Re: Fiesta by Kelston Ceramics New Zealand ... another! I have recorded "fiesta pattern number 572 " from the Red Stock book 1967 Auckland Museum, I wonder if its the same pattern? I would agree with that timeframe Janice for this pattern. Even earlier perhaps. I think this backstamp is the same typeface as the mark for the dotty fiesta ware and for fiesta Gaye. I will compare the pics when I get a chance. 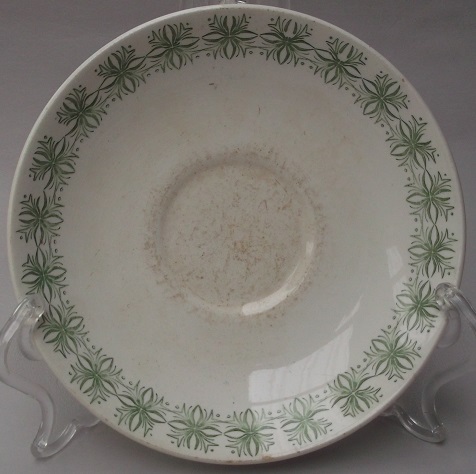 How odd to find this pattern in a 1962 Price List as Stellar d397 with an underglaze Green Border Stamp and in the coupe shapes, just like this one.....??? It could be that your example has the wrong backstamp.? I have a couple of saucers that clearly have the wrong pattern name. Astra and Stella sound like a simalar theme.